Equestrian or horse races have long been a tradition in Italy. The Palio di Siena located in Siena, Italy, got its modern start in 1656. Vicenza Designs Equestrian line allows you to express your passion for horses in your home in a unique way. 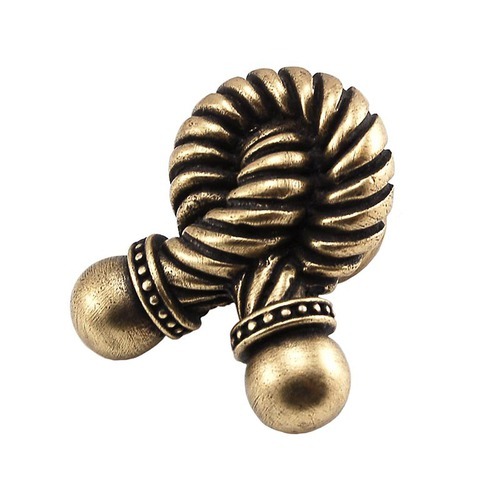 The knotted rope designed large knob is available finishes include Antique Brass, Antique Copper, Antique Gold, Antique Nickel, Antique Silver, Gunmetal, Oil-Rubbed Bronze, Polished Gold, Polished Nickel, Polished Silver, Satin Nickel and Vintage Pewter. Mounting hardware is included. 100% lead free pewter. Handcrafted in the USA. Equestrian or horse races have long been a tradition in Italy. The Palio di Siena located in Siena, Italy, got its modern start in 1656. Vicenza Designs Equestrian line allows you to express your passion for horses in your home in a unique way. Leather pulls are accentuated with a pewter horse head. Choose black or brown leather in 3, 4, 5 or 6 inch lengths. Available finishes include Antique Brass, Antique Copper, Antique Gold, Antique Nickel, Antique Silver, Gunmetal, Oil-Rubbed Bronze, Polished Gold, Polished Nickel, Polished Silver, Satin Nickel and Vintage Pewter. Mounting hardware is included. 100% lead free pewter. Handcrafted in the USA. Equestrian or horse races have long been a tradition in Italy. The Palio di Siena located in Siena, Italy, got its modern start in 1656. Vicenza Designs Equestrian line allows you to express your passion for horses in your home in a unique way. The horse head designed small knob is available finishes include Antique Brass, Antique Copper, Antique Gold, Antique Nickel, Antique Silver, Gunmetal, Oil-Rubbed Bronze, Polished Gold, Polished Nickel, Polished Silver, Satin Nickel and Vintage Pewter. Mounting hardware is included. 100% lead free pewter. Handcrafted in the USA. Equestrian or horse races have long been a tradition in Italy. The Palio di Siena located in Siena, Italy, got its modern start in 1656. Vicenza Designs Equestrian line allows you to express your passion for horses in your home in a unique way. The 3 inch pewter pull gives you the option to choose a leather or fur insert that smartly coordinates with your country or southwestern decorating style. Insert choices include black, brown and pebble leathers or black, brown, tan, gray, jaguar, and zebra colored furs. Available finishes include Antique Brass, Antique Copper, Antique Gold, Antique Nickel, Antique Silver, Gunmetal, Oil-Rubbed Bronze, Polished Gold, Polished Nickel, Polished Silver, Satin Nickel and Vintage Pewter. Mounting hardware is included. 100% lead free pewter. Handcrafted in the USA. Equestrian or horse races have long been a tradition in Italy. The Palio di Siena located in Siena, Italy, got its modern start in 1656. Vicenza Designs Equestrian line allows you to express your passion for horses in your home in a unique way. The leather pull is accentuated with a round dot edged in a rope pattern. Choose black or brown leather. Available finishes include Antique Brass, Antique Copper, Antique Gold, Antique Nickel, Antique Silver, Gunmetal, Oil-Rubbed Bronze, Polished Gold, Polished Nickel, Polished Silver, Satin Nickel and Vintage Pewter. Mounting hardware is included. 100% lead free pewter. Handcrafted in the USA.